By an amazing twist in literary evolution there is a lucid, well-versed scientific writer on evolutionary genetics where there was none before. Fact is, Richard Dawkins is one of only very few brilliant scientists who can also write coherently. 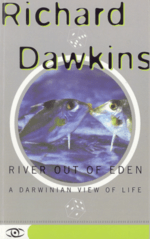 River Out of Eden is a explanatory book rather than a exploratory one. Dawkins swishes through the basic concepts of genetic evolution and the impacts of those concepts at a brisk pace. Along the way, the digital river concept is well illuminated in all it's simplicity as well as some of the very complex underpinnings of it. Very cursively, the concept uses a real life river metaphor as the river branches out into the delta. If the river is life, the branches are different species. Some branches are successful and flow on while others dry up and disappear. The river consists of genes, who if they are successful ones, manage to replicate and move further downstream. But you'd better read the book for some real understanding. The best part of the book for me is that Dawkins disassembles a few evolutionary counter-arguments, such as the "design argument". This states that since a certain something, say an eye, is so perfect it had to be designed as a unit as anything less than the current state would not function. Richard Dawkins reverses this argument to state that since any sort of image recognition, be it only light sensitivity, is more conducive to survival of the specie (read genes as part of a river branch) than none at all, the evolution of different sorts of eyes is quite probably. The camera eye we as humans or birds have are only the best example of eyes we know about, slugs for example have simpler vision organs. This doesn't make the slugs eyes less useful for the slug, only less acute in comparison with ours. And an eye-less slug does of course have much less chance of finding food and shelter, thereby putting the species survival at severe risk. Richard Dawkins strength as a writer comes from his ability to explain complex ideas in simple but not dumbed down ways. As a science writer, that is something sorely needed in the field. Good read. Buy River Out of Eden from Amazon.com or buy River Out of Eden from Amazon.co.uk . Last updated by jack on 04 March, 2002 in Reading.